Looking for a new incredibly addicting crossword puzzle game that checks all the right boxes? • NO ADS - Yay! • ALTERNATE WORDS - Think a word should fit? Go ahead and use it. • UNIQUE WORDS - Don't spell the same 3 letter words over and over! 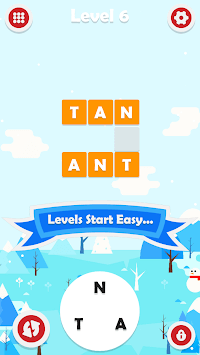 • EASY TO SUPER HARD - Words are from 3 letters to 8 ... EXCITING! • TO GET ZEN - Uninterrupted challenging fast gameplay. 'Fast Play' mode let's you get in zone! • PLAY ANY ORDER - Unlike other games like this you can play in any order you want. This game is for people who like swiping word search puzzles but are tired of all the things the other games are doing. Now you can have just the experience you want for a low cost. This game gives you 49 free puzzles and lets you unlock another 755+ if you like it. No more ads, no more coins, no more unrelated mini-games, ... just pure SWIPING CROSSWORD SOLVING FUN. Out just in time for Christmas and New Years. Enjoy your time off solving fun word puzzles. Thanks so much for trying this game. I hope you find it meets all your expectations and wants. If it does, please feel free to rate it and give us a shout out! If it doesn't please let me know how I can make it better. I want you to enjoy this game and the best way to do that is to make it meet your needs and wishes. • 49 free puzzles across all difficulties. • Just ONE low cost IAP to unlock all current and future puzzles. • 3 .. 8 letter puzzles. • 'Fast Play' mode to shorten tween puzzle times and turn off pop-up tips. • Separate 'Sound' Effect and 'Music' controls. 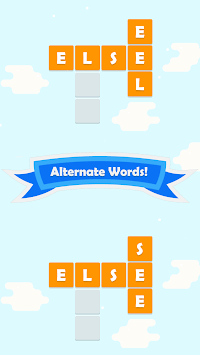 • 'Alternates' mode enables the use any word that fits without breaking other word spellings. • Very few words are used more than once to avoid boring repetition. • Free 'hints' can be turned on for those times you need a little help. • 'Skipping' mode can be enabled to skip locked and previously played levels in case you like to skip around. • Fast navigation by letter count on level map. • Polished a little more. Oooh shiny!